With a totally new, totally sleek 53-knot performance cruiser, Hunton Yachts is emerging as a force to be reckoned with in the global luxury boating market. The two-cabin, two-head Hunton 55 will be introduced to the U.S. at the Miami boat show in 2020. It will be followed by a new Hunton 45, an updated version of its current 43, while the company’s 8-meter and 10-meter RIBs are being sold as high-end, high-performing tenders and day boats. As a builder, Hunton dates to 1979, when Jeff Hunton, a British offshore powerboat racer, started the company. He won the British offshore championship in his class with his first boat; he went on to win six more championships. Hunton built 14 different performance cruising designs over the years, while his boats won ten British racing championships. Hunton left the company in 2016 after a corporate restructuring. At that time, Pool, who had joined the company in 2010, took over as CEO and sole director, with the goal of launching new luxury cruisers based on modified versions of Hunton’s deep-V racing hull. Her background had been in international finance and luxury fashion. She worked on the London trading desk of Credit Suisse and became an executive director of Goldman Sachs before she co-founded a fashion design business (winning a Vidal Sassoon Young Designer of the Year Award). After selling that business, she ran the European high-yield desk for the Bank of America, then started a structured-finance consulting firm. In 2008, Pool founded a small luxury fashion model, sold it in 2010, and became part of a small team that bought Hunton that year. She says that Hunton is not selling a lifestyle. “They already have the lifestyle. We provide an extension of everything else they own. All the details of the boat provide the creature comforts they have in every other aspect of their lives. The boat will have the same comforts they have in their luxury car or private jet.” In addition, Hunton is starting a customer concierge service so owners will have a unique relationship with the dealers. 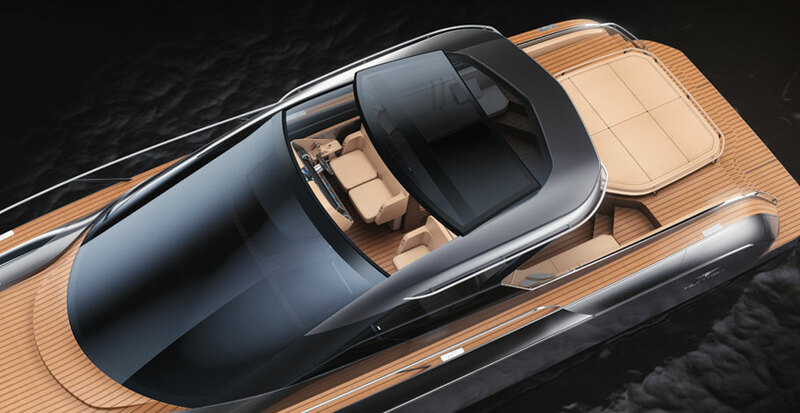 The new Hunton 55 comes with striking looks and head-turning performance. A wraparound windshield flows back to the cockpit. The profile is low and the lines are sleek, elegant and flowing. Power comes from twin 1,000-hp MAN diesels paired with Arneson surface-piercing drives. The boat is projected to top out at 53 knots and cruise at 42 knots, with a range of 500 nm. The hull has a deep-V entry, a low center of gravity, hard chines and lifting strakes. It’s laid up with resin-infused, post-cured epoxy composite construction. The new 55 will be equipped with just about everything available on the high-end performance cruising market: A MasterTrim drive and tab system; Marex OS 3D digital joystick, gyro stabilizer, autopilot, bow and stern cameras, electric helm seats, CZone digital switching, key-fob activation and remote diagnostics monitoring. Plus a panoramic hardtop with tinted glass and an opening sunroof, and a side-entry garage for a 9-foot tender. The Hunton 55 is trimmed with teak everywhere. There are twin seats at the helm and co-pilot areas. The cockpit is designed for entertaining, with plush settees on each side, with tables. A large sunpad aft can be adjusted so the two lounges there can face forward or aft. Below, the accommodation deck has two double cabins, separated by a lower salon and galley. The master stateroom is filled with natural light from side windows, and it has an en suite head and shower. The guest stateroom is forward and has two berths that can be converted to a queen; it shares the day head. Specs. : LOA: 55’0”; Beam: 14’5”; Draft: 3’5”; Disp. : 41,880 lb; Fuel: 282 ga.; Water: 232 gal. ; Power: 2 x MAN V8-1000 with Arneson ASD11 with MasterTrim drives.